College & University Student ID Info - ASK. LEARN. VOTE! The Wisconsin voter photo law makes it particularly difficult and confusing for students enrolled in Wisconsin's public and private universities, colleges and tech schools to be eligible to vote and to be able to cast their ballots. But with a little bit of planning and action now, students can secure the necessary ID they will need to be able to cast a ballot on November 6th and beyond. Find out if your current student ID is an acceptable form! Students are urged to look up their institution NOW on the appropriate list below to find out if their current student ID is an acceptable form of photo ID in order to be able to vote on April 5th and beyond. If it is not, then you can also determine if you are able to obtain a school-issued voter photo ID from your school and how to do so. 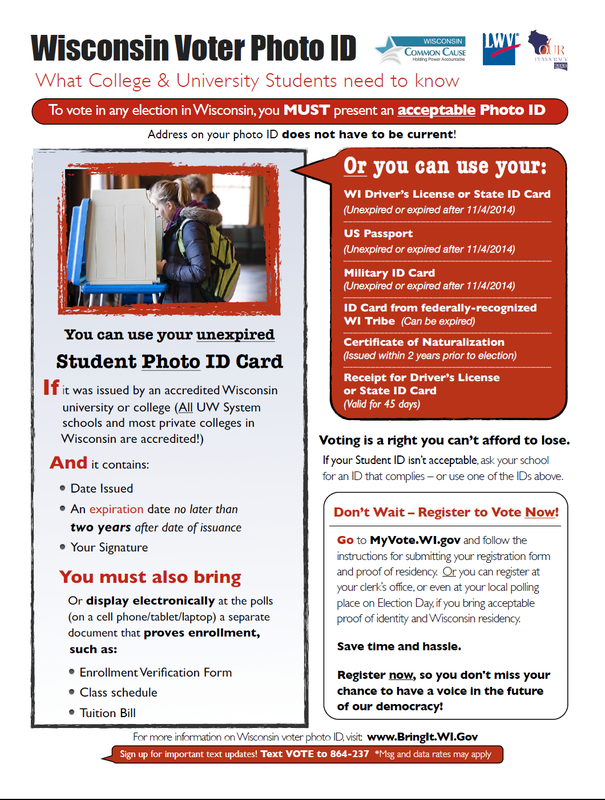 The standard student ID at only three of the University of Wisconsin's four-year schools and at seven of the state's 23 private schools can be used as a voter photo ID.